Thousands of people gathered in the Polish city of Gdansk for the funeral of the city's mayor, Paweł Adamowicz, who was fatally stabbed last Sunday. The service at St Mary's Basilica was also broadcast on television across the country. "Because you started to bridge the gaps, so the wave of hatred would stop," She said. "My dear, your thoughts give us strength and this strength is much needed by us now because tough times are coming." More than 3,500 people were reported to be inside the basilica, including European Council President Donald Tusk, Polish President, Andrzej Duda and ex-President Lech Walesa. 53 year-old Mr Adamowicz was stabbed in front of hundreds of people at a major event aimed at raising money for hospitals. Mourners expressed their shock and grief at his death. One said: "We are in mourning and we are very sad. I can not focus on my work and my daily obligations. It is as if a family member has left us." Another added: "I hope this death will help to remove or at least limit the language of hatred but it is sad that we must wait for a tragedy togather." 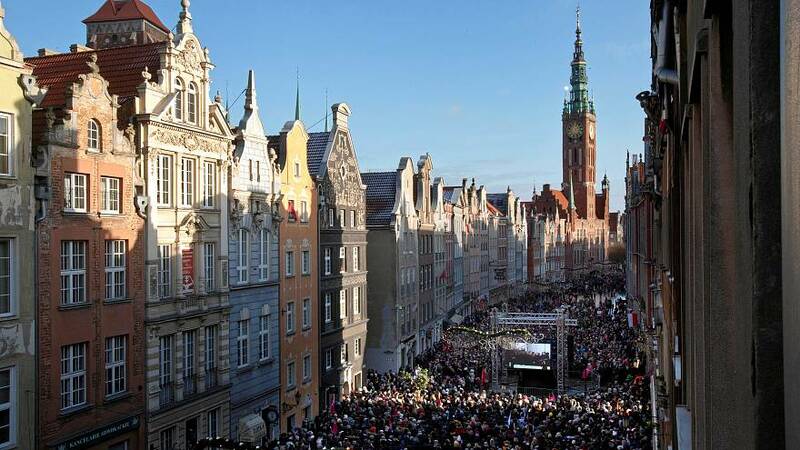 Euronews reporter in Gdansk, Leszek Kablak, said the scale of the funeral was very significant. "Paweł Adamowicz's farewell proved how important he was to the population of the city. The Mayor's ashes were buried in St. Mary Basilica," he said.